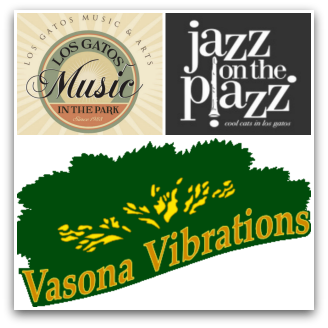 Los Gatos summer music begins soon! http://www.southbayfolks.org/vasona/#psched Performances are held every Saturday in June and July from 5-7pm, on the lawn near the Ranger Office, and just down the hill from the pedestrian entrance at University Ave and Pepper Tree Lane. Referenced in the list below as VV. Please note that a fee is charged for parking within Vasona. Music in the Park site: http://www.lgmip.com/ Schedule info (who plays which day) http://www.lgmip.com/miperformers.asp Referenced in the list below as MIP. (3) Jazz on the Plazz http://www.jazzontheplazz.com/ Wednesday evenings 6:30 to 8:30pm, June 22nd through August 24th. (No blankets on the lawns.) The Los Gatos Town Plaza is on West Main Street and Santa Cruz Avenue near the post office in downtown Los Gatos. Schedule of who’s playing what: http://www.jazzontheplazz.com/jazz_artists.asp Referenced in the list below as JP. Los Gatos is a fantastic place in which to live and recreate, but no time more than the summer. Enjoy!